Unique Bridal wedding shoes. An unknown author once penned the adorable quote: Cinderella is proof that a new pair of shoes can change your life. A unique and smart shoe selection for your wedding day look can be an unexpected surprise or the perfect accessory for your statement style. A little sassy, these glittery silver heels have a lot of personality. With a feather accent in the front, this bedazzled shoe would be perfect for a Gatsby-inspired affair or even a fun beaded reception dress. This pair of cut-out leather heels is artistic and fashion forward. Leather leaf-like ankle cuffs are tied with thin ribbon with a strap over the toes for added support. This is a shoe that can heat up any dance floor. A pair of metallic-toned Badgley Mischka's can ramp up the glamour factor. These open-toed heels feature statement beading in a structured design that is modern and marvelous. They are a mixture between daring and dazzling. Who says your wedding day shoes have to be neutral-colored? If you've got a loud personality, show it! These white peep-toes are covered in sweet pink hearts and have a teal blue foot bed. Flats don't have to be simple or boring. 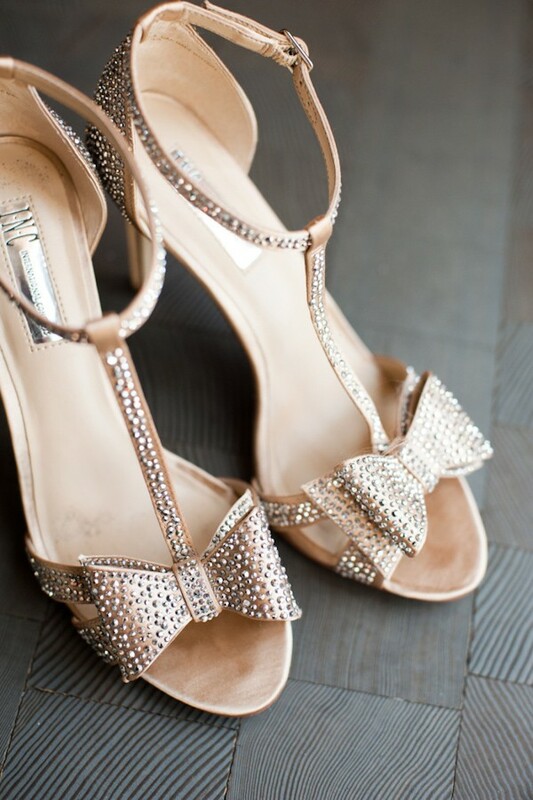 In fact, many brides opt for very glamorous flats on their wedding days to be classy but comfortable. This pointed-toe pair features a shimmery gold design with delicate crystals at the toe that continue towards the heel. Simple, practical and perfect! If you want your shoes to show off, this pair of ankle strap heels will do the trick. A sky-high pair of gold stilettos is drenched from heel to toe in silver crystals. The peep toes are accented with darling crystal bows for a fun and flirty effect. You can never have too much embellishment when it comes to pearls. 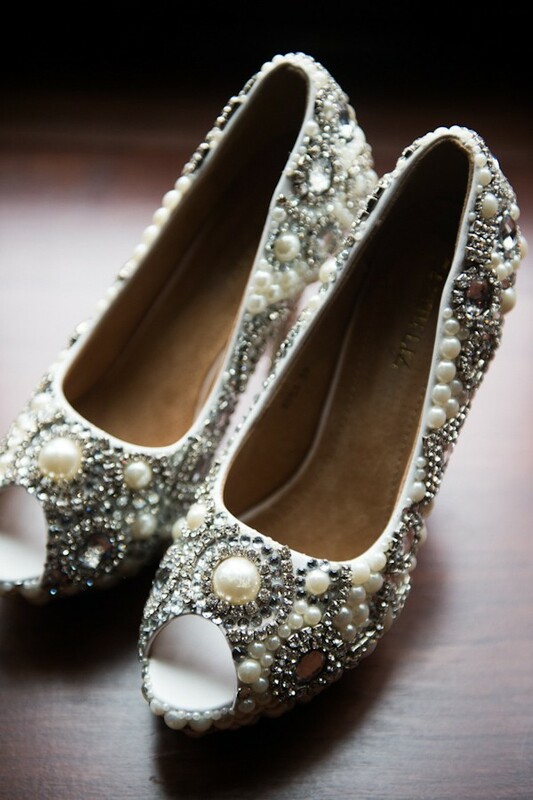 This pair of heels features generous amounts of pearls and crystals in all sizes with pretty halo designs all over. For the classic girl with a little flare, this is an ideal choice. Of course, the dress is the biggest part of your bridal look but don't discount the fun you can have with an amazing pair of shoes! Walk down the aisle in style. Winter/Spring 2015 Volume 2 Issue 1 is Here!